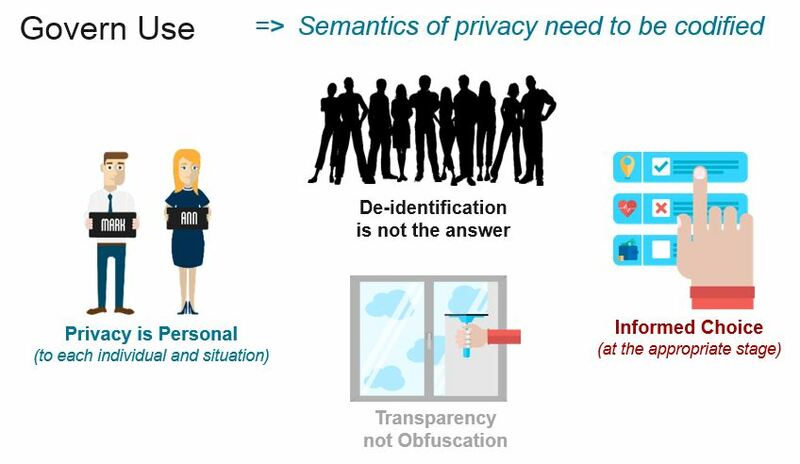 Privacy is a gnarly topic that divides people; this isn’t too surprising since privacy is personal and specific to each individual and each situation. I may be happy to share my driving history with my auto insurer but not my employer, or my food shopping history with my health provider but not my health insurer (unless there is an incentive to do so). Sometimes my privacy decisions are thoughtful and sometimes arbitrary, but they are always mine and personal to me. These days the privacy discussion tends to degenerate into a shouting match between those perceived to be protecting mankind from exploitation and those that are out to exploit and manipulate. Clearly the situation isn’t that black & white and the rhetoric isn’t helping us move forward in a productive way. I personally believe that we are fighting a loosing battle in trying to prevent data from being shared; the Internet is just too porous and our use of social, mobile, and increasingly “connected devices” (the Internet of Things in technology parlance) is only exacerbating the situation. So if we can’t stop the flood of data, and in many cases it’s not in our interests to try, how do we control how it can be used? This is where I feel semantic technology can help. Below are a smattering of links to studies, programs, and opinions around identity ecosystem. Some I agree with, others I don’t, but all of them ask interesting questions which need to be asked and answered over the coming years.